The walk “Ruta de los Pinares de la Barrosa (Sendero de la Vereda)” starts at the entry of the pine wood la Barrosa, opposite the touristic information at the urbanisation Novo Sancti Petri. The walk begins at the entry of the pine wood la Barrosa close to a restaurant. The path is well signposted. After passing the pine wood, you walk past a sport area, a church until a straight path leads you into another pine wood where a typical andalusian tavern invites for a break. On this walk one can easily see the diversity of fauna and flora of the area. The most common species is the pine (Pino piñonero). Also cork-oaks and wild olive trees can be found. The bushes are a combination of typical mediterranean species as small palms, broom, myrrh, lavender and various types of rockroses. Apart from these plants the pine wood helds other treasures of the andalusian botany such as the Thymus albicans (thyme), Drosophylla lusitanica, (a carnivore) and Corema album, also known as Camarina. These species are listed in the catalog of endangered plants. The fauna consists mainly in small mamals (hedgehogs, african mongoos) and a rich birdlife. But it is one species that reflects best this habitat, which is the cameleon. on the coastal road from La Barrosa to Conil. the old barracks of the Guardia Civil, where the walk starts. Our starting point is the Tower of the Pig (Torre del Puerco) (XVI cent.) a former watch tower at the town border with Conil district. From here we go West along a paved path which passes along the high part of a former cliff over fossilised dunes. During the walk we can discover the variety of dunes and local beach species such as juniper and sabina. We continue along the dunes (no clear path) or the beach until reaching the start of the Seaside Promenade (Paseo Marítimo). This ends on Barrosa Ave. (1st stretch), at a watch tower – the Red Tower (Torre Bermeja) (XVI cent.). Here there is an incline, giving the option of taking the higher road through an area of coastal pinewood, including the Parque Periurbano Pinares de la Barrosa , with viewpoints (“Magic Points”) on the edge of the cliff. Or one can, at low tide, carry on along the beach, with rocky areas and the typical “roca ostionera” (oyster stone) sheltering various easy-to-see marine species. At the end of the cliffs is the viewpoint (Punto Mágico) from which one can see the Sancti Petri Castle ( XVII-XVIII cent) island. We continue along the beach up to the village of Sancti Petri, a former tuna fishing centre (almadraba), now with a marina at the mouth of the Sancti Petri Channel, one of the main entry and exit points for the water of the ‘marisma’ (marsh) area, which is within the limits of the Bay of Cádiz Natural Park. In Sancti Petri there are many possibilities to eat fresh fish and typical andalusian tapas or just relax with a drink enjoying the beautiful view. From the industrial area Urbisur in Chiclana take the direction to the beaches on the Avenida de los Descubrimientos. Turn right at the roundabout before the blue bridge and follow the river Iro until the sewage-works where the walk begins. 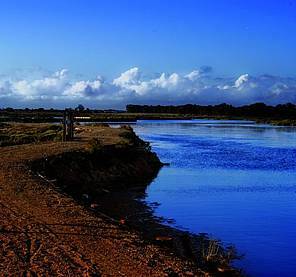 Almost all this route goes along a track on the right bank of R. Iro within the Natural Park Bay of Cádiz. On this walk one can easily see the diversity of fauna and flora of the area and the salinas and salt workers houses (casa salinera), part of the cultural heritage of this area. At the start we walk past El Torno water treatment station (estación depuradora - E.D.A.R.) and we continue straight on this track. Parallel to the first stretch is an artificial lake, part of the town park of Las Albinas del Torno, (providing irrigation). Towards the last 3rd of the path, just before a little bridge, on the right the salina de Cañaveral can be seen and passing this there is the salina Santa María de Jesús where there is the Institute of the Environment of the Bay of Cádiz Mancomunidad (dealing with sport, recreation and environmental education). The walk continues for about 300 m. towards the nearby outflow of the R. Iro into the Sancti Petri Channel (Caño). Novo Sancti Petri or from the town centre Chiclana. The walk starts in a little pine wood (pino piñonero), a reafforestation done during the 19 th century to protect the soil from desertification. Passing the pine wood you reach an old salt workers house of the saltern. Here you already see the typical waterways of the saltern. A wide net of channels where the salt water gets more concentrated until it finally crystallises by evaporation. From here the walk continues the outer wall which surrounds the saltern and prevents it from uncontrolled water inflow. The main waterway to our left is the Caño de Carboneros which itself is fed by the Caño de Sancti Petri. To our right we have a good view over the old salt pans of the saltern. 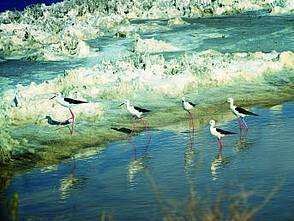 At the moment the salt pans are divided by a wall and here we can observe the great variety of sea birds as flamingos, little terns, plovers, stilts, spoonbills and avocets. Here we have too options, or follow the walk straight on until the urbanisation Los Gallos or take a short cut to our right until we reach the starting point again. Route Pinewood "Pinar de los Franceses"
Charca de la Violeta where the route starts. 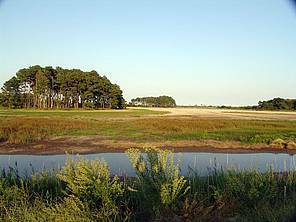 The pinewood “Pinar de los Franceses”owes its name to the fact that in the area there used to be a French defence post (the Batería Colorado) after the famous Battle of Chiclana (5th of March,1811), during the War of Independence. The path goes along the edge of the Bay of Cádiz Natural Park between pine groves and marshes through an area of eucalyptus which provide some shade. The piñonero pine is a species adapted to sandy soils, droughts and salty sea air, so it replaced the juniper and the native cork oak woods, of which only a few traces remain today. Large plantations were created to provide timber for naval construction, especially in the 18th century. 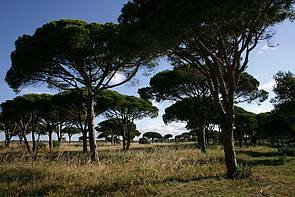 The Chiclana pinewoods were planted purely for economic reasons with the aim of supplying wood for the Bay. Along the path we can get to higher areas which give excellent views of the marshes. Coming from the industrial part Urbisur in Chiclana take the direction towards the beaches on the Avenida de los Descubrimientos. Cross the river and at the second roundabout turn right into the road Cuba and keep straight on passing the school I.E.S. Ciudad de Hércules. The path begins at the start of the Camino del Molino (Mill Way), at the end of C/ Cuba, going into the Bay of Cádiz Natural Park. The walk starts along the edge of a little pine wood on the right, bordering the marsh area. From here the whole walk is between old salt pans some of which have been reconverted to agriculture, others abandoned. The area is an overwintering one for migrating birds of the limicoline species (living in muddy areas) – little terns (charrancitos), plovers, (chorlitejos), stilts (cigüeñuelas) and avocets (avocetas), and for flamingos, herons, spoonbills, cormorants (flamencos, garzas, espátulas, cormoranes). The end of our walk is very near to the Sancti Petri channel, the most important one because it links the Bay with the Atlantic Ocean.